Here at the Alternative Daily, it’s fair to say that we’re just a little bit crazy about apple cider vinegar. Stylishly abbreviated to simply “ACV”, this elixir of health continues to amaze us with it’s impressive versatility and far-reaching health benefits. But while ACV is hot property in the health world these days, it wasn’t always the star of the health show. Arguably “discovered” around 5000 years ago, vinegar came to the attention of mankind when the juice of either dates or grapes (the history is a little unclear on which) was forgotten about, turning first into wine and then into vinegar. A few sips of this potent brew, and it was clear to the ancient Babylonians that they were on to something wonderful. Cultures across the world were soon using vinegar in its various forms as a food preservative and pickling agent, and it wasn’t long after that when vinegar began to make its way into the medicinal realm. Written records dating back to biblical times make reference to the use of vinegar as a food flavoring, energizing drink and as an important medicinal ingredient. In ancient Greece, Hippocrates wrote how he prescribed apple cider vinegar mixed with honey for a “variety of ills,” including coughs and colds. Fast forward to present day, and apple cider vinegar is probably more popular than ever before. And it’s not without reason. In this article, I’ll explore some of the many proven benefits of ACV for health, beauty, everyday living and more. Then, once you’ve got some idea of just how versatile this natural ingredient really is, we’ll dive into the 14-day ACV challenge. By the end of this post, you’ll have all the tools you need to enrich your life with apple cider vinegar. While there’s no shortage of anecdotal evidence supporting the medicinal, beauty and other benefits of apple cider vinegar, at first glance it seems like there isn’t a lot of scientific evidence to back up those claims. But when you start digging, there’s actually some very promising research showing that the powers of ACV are a force to be reckoned with. It’s hard to believe that simply swigging back a little ACV before, during or after a meal might help balance insulin sensitivity and lower risk of developing diabetes… but that’s exactly what the scientific literature says it can do! In a 2004 study published in the Journal of Diabetes Care, researchers showed that drinking 20 grams of ACV with 40 grams of water helped to elevate insulin sensitivity in type 1 and type 2 diabetics by 34 percent and 19 percent, respectively. In a 2007 study, type 2 diabetic patients experienced a significant decrease in fasting glucose levels simply by consuming two tablespoons of ACV at bedtime. Whether you’re diabetic or not, ACV is definitely a good choice for regulating insulin, dampening glucose spikes and alleviating other symptoms of diabetes. In addition to promoting healthy insulin sensitivity and lowering blood sugar spikes, ACV has been shown to increase satiety after meals — and that spells good news for folks looking to shed a few pounds! A 2005 study published in the Journal of the American Dietetic Association demonstrated that consuming a small amount of vinegar with a high-carb meal reduced appetite for the rest of the day. The resulting reduction in caloric intake of over 200 calories a day would add up to a monthly weight loss of around 1.5 pounds. Another study published in the same year showed that drinking a little vinegar while eating bread increased levels of satiety while simultaneously lowering blood glucose and regulating insulin sensitivity. Perhaps one of the most famous uses for ACV is in controlling candida overgrowth. As many of you know, candida is a type of parasitic yeast that often gets a little out of hand in the gut, and can cause all kinds of adverse autoimmune and mental effects. A 2014 study showed that 30 minutes of exposure to ACV had a strong antifungal effect on a wide range of candida species, including the problematic Candida albicans. 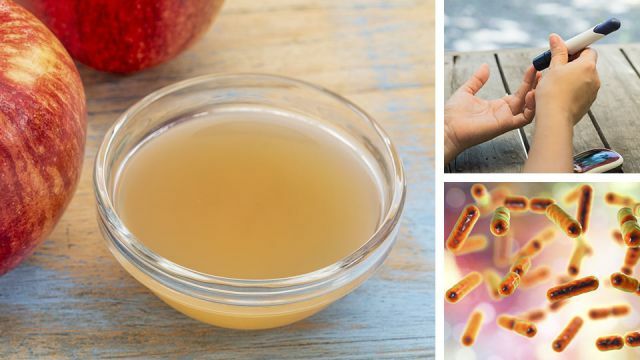 Another study published last year found that ACV not only exhibited strong antimicrobial properties against candida, it was also highly effective in treating E. coli and S. aureus, two other parasitic microbial species. You’re often hearing about the importance of antioxidants, but have you ever stopped to wonder what that label actually means? In essence, antioxidants protect against oxidative damage caused by free radical activity, which can undermine the integrity of every cell in your body and lead the way to accelerated aging, certain disease states, and cancer. Not bad, for a humble vinegar. Finally, there’s the probiotic potential of raw ACV to consider. Apple cider vinegar is created when certain bacteria, namely Acetobacter pasteurianus, continue to ferment apple cider beyond the alcoholic phase, increasing acetic and malic acid concentrations and creating that intense vinegary tang. During this process, plenty of other bacteria and yeasts grow and colonize the apple cider, with scientists isolating close to 100 different species of microorganisms living in the average drop of organic, raw ACV. Many of these species are of the Lactobacillus and Acetobacter genus, both of which include many of the known human probiotics. When consumed, these handy little guys take up residence in your gut and help to increase the biological diversity of your microbiome and support a wide range of important functions in the body. Not only that, ACV contains a healthy dose of pectin: a natural prebiotic carbohydrate that helps to remove toxic byproducts and harmful bacteria from your digestive tract, thereby giving your very own good bacteria more of a fighting chance. Ready to make ACV a big part of your life? You should be! There’s no denying that ACV is loaded with vitamins, nutrients, probiotics and beneficial acids that make it a wonderfully versatile, immensely powerful ingredient both as a consumable and as an all-around household item. Here’s how you can get the most bang for your buck with every bottle of ACV. Easily the most popular way to integrate ACV into your daily health routine is to drink it first thing in the morning, as soon as you wake up. Simply mixing 1 to 2 tablespoons of raw ACV in a glass of water and drinking it down helps to simultaneously re-hydrate and nourish your cells, providing an instant energy boost and gearing you up for a great day ahead. My trick? Mix up your ACV health tonic the night before and leave it on your nightstand, so there’s no excuse to avoid drinking it when you wake! I no longer worry about the occasional gluttonous overindulgence. Why? Because I have ACV on hand to save the day if I suffer from a bout of indigestion, the kind that has most people out of action for hours with gas, bloating and general nausea. Whenever I have a large meal or eat something a little questionable, with the first signs of digestive upset I’ll head straight for the ACV, pour a generous tablespoon or so into half a glass of water, and drink it back. The malic and acetic acid in ACV assist your innate digestive acids in breaking down stubborn proteins and fats, while simultaneously discouraging potentially pathogenic foodborne bacteria from taking up residence in your stomach or gut. If indigestion is a common problem for you, drinking a diluted glass of ACV before, during or after meals might really help. If you’re constantly struggling to keep off the pounds, or find that three meals a day is never enough and you’re a slave to the snacks, consider making ACV a part of your daily routine. As I explained earlier, studies show that ACV can actually significantly increase satiety after eating, meaning you’re less likely to reach for the salty or sugary snacks after meals. As always, a tablespoon of raw ACV in a large glass of room temperature water should be just the ticket. We’ve all been there: you just got home from a torturous day at work and you can’t possibly imagine how you could find the energy to cook a nutritious dinner. Invariably, out comes the emergency packet of potato chips hiding in the back of the pantry, and before you know it you’ve polished off the lot. These kinds of carb binges aren’t exactly great for your body (or your self-esteem! ), but it just so happens that ACV can help to lower the detrimental effects. Drinking some ACV in a glass of water after (or during, if you have the presence of mind!) eating a whack of carbs can lower the inevitable blood sugar spikes and help to regulate your insulin sensitivity… a big deal, even if you’re not diabetic! On its own, ACV presents a formidable threat to any sore throat. It’s acidic pH literally wipes out droves of the pathogenic bacteria species that cause sore throats, while the beneficial bacteria in raw ACV discourage further development of pathogenic microorganisms. That’s all well and good, but I like to take the sore-throat thwarting powers of ACV one step further and mix up a wonderful throat tonic. I simply add a splash of ACV and a dash of raw honey to a glass of warm water, sprinkle in a little unrefined sea salt, and drink it back. The beneficial effects are virtually instantaneous! Earlier, I talked about how organic, raw ACV is loaded with almost 100 different species of beneficial bacteria and yeast. These little guys can help to rebuild your gut microbiome, and the high levels of pectin in ACV help to remove toxic byproducts from your digestive tract and encourage a healthy population of bacteria in your gut. This means that simply drinking a tablespoon or two of ACV in a glass of water (diluting it in water helps to prevent the acid burning your throat) can act as a daily probiotic. Just make sure it’s raw — the pasteurized stuff is virtually lifeless! I long ago threw out my nasty conventional shampoo and conditioner in favor of a new holistic hair care regime: ACV and baking soda. First, I’ll mix 1 to 2 tablespoons of baking soda in a glass of water and pour it over my hair in the shower. After gently rubbing the diluted baking soda into my scalp and rinsing it off, I follow up with 2 tablespoons of ACV mixed into a glass of warm water. Depending on how dry my hair feels, I’ll leave the ACV in for up to 30 seconds, then give it a good rinse. Baking soda is highly alkaline, and helps to remove oil buildup in your hair while gently exfoliating the scalp and washing away those unwanted dead skin cells. ACV acts as the conditioner, balancing the high-pH baking soda with it’s acidity and leaving your hair silky and soft. I do this once every two weeks, and my hair has never looked or felt better. Many people swear by ACV as the only skin toner they’ll ever use. According to them, ACV smooths the skin, rebalances the pH, alleviates skin conditions like eczema and psoriasis, and even slows the signs of aging. That’s a tall order for something as simple as ACV, but considering it’s decent antioxidant content and therapeutic acidic compounds, I wouldn’t be surprised if all of those claims were true. Mix 1 part ACV to two parts water (make it more diluted if your skin is extra sensitive) and dab it onto your skin with a cotton ball or soft face cloth. Leave it on for around a minute, then gently rinse off with warm water. While ACV makes a great natural conditioner, in higher doses it can also provide a powerful treatment for dandruff. The science behind how this works is a little murky, but the theory goes that the malic and acetic acids discourage the formation and growth of the dandruff-causing fungus Malassezia globosa. How strong you make your anti-dandruff brew is up to you, but I’d start with 1 part ACV to 1 part water, gently rub it into your scalp while you shower, and if after a week this doesn’t do much you can increase the amount of ACV you use. The same antibacterial qualities of ACV that make it dynamite against dandruff and sore throats also mean it’s an excellent choice for a natural mouthwash. Add a tablespoon of raw ACV to half a cup of water and slosh around in your mouth for 30 seconds. Not only will your teeth feel cleaner, ACV is also said to fight bad breath too. Worried about pesticide and synthetic fertilizer residues on your non-organic produce? Apple cider vinegar helps to leach out some of the chemical residues contained in the skin and shallow flesh of fruits and vegetables, and at the same time has been shown to kill off food-borne pathogens like E. coli and salmonella. Simply fill a bowl with cold water, add in a tablespoon of apple cider vinegar, and submerge your produce in the bowl for two minutes, mixing occasionally. Give the produce a quick rinse under the tap afterwards to ensure all the chemicals are removed. One of ACV’s oldest uses is in the preservation of perishable foods like fruit, vegetables and even meat. ACV makes the food it comes into contact with more acidic, deactivating oxidizing enzymes and removing bacteria responsible for spoilage. Any pickle or preserve recipe that calls for vinegar can use ACV, and I especially like making relishes and apple chutneys with my homemade ACV. I long ago stopped buying salad dressings from the store, partly because they’re an unnecessary expense, but mostly because they’re all filled with nasty and pointless ingredients. These days, my salad dressing consists of ACV, olive oil, and sometimes a little honey or wholegrain mustard. ACV helps to thin the oil and balance out it’s fatty richness, while also helping to bring out the flavor in your salad and help you to digest more of the nutrients. My general rule of thumb is two parts oil to one part ACV, but play around with quantities and see what works best for your tastes. There are few things more annoying than a persistent cloud of fruit flies. Where the heck do they come from? Whatever their origin, they quickly materialize whenever you’re working with anything containing fruit, and it’s generally quite hard to get rid of them once they’ve taken up residence in your kitchen. ACV provides a simple, natural, chemical-free solution. Just fill a cup halfway with ACV, add in a small squirt of dish soap, and watch the little suckers drop… like flies. The ACV acts as an irresistible fruit fly attractant while the dish soap makes their wings heavier and forces them to sink to a vinegary grave. All that, and we’ve only just begun! There’s plenty of other amazing uses for ACV, so be sure to continue experimenting with ACV long after you’ve completed the 14-day challenge. There’s a reason why ACV has been a critically important ingredient in many cultures for thousands of years, and it’s fair to say that it’ll continue to provide great value well into the future! Be sure to leave a comment if you’ve got an amazing use for ACV that I haven’t covered here, and enjoy the challenge! Hey Buddy!, I found this information for you: "Take This 14-Day ACV Challenge For Weight Loss, Oral Hygiene And More". Here is the website link: https://www.thealternativedaily.com/take-this-14-day-acv-challenge-for-weight-loss-oral-hygiene-and-more/. Thank you.